Create an unforgettable scene in Sherri Hill 32313. This two-piece cocktail dress offers a halter neckline with cut in shoulders. The crop top is completely accented with color-coordinating beads adding texture to your sassy vibe. Laced skirt with scalloped hemline perfectly matched the top, giving the dress a vintage yet chic appeal. 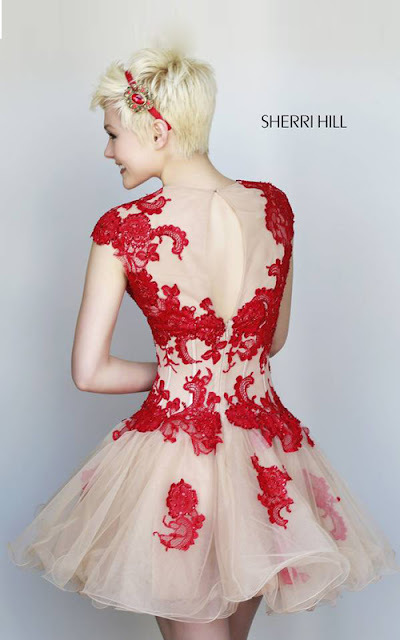 Plunging Lace Vintage Cocktail Dress by Sherri Hill. Allover delicate white lace covers the bell sleeves, deep "V" neck and keyhole cutout back on this short yet elegant bohemian inspired cocktail dress. Beaded crystal and gold empire waist adds a bit of sparkle.Twirl and dance in this delightful cocktail dress from Sherri Hill 32260. The deep v-neckline bodice is edged in glittering gilded adornments and has long voluminous sleeves for a lavish style. Cinched at the empire waist to create curves, this chic ensemble drapes to the scalloped mid-thigh hem in layers of fabulously romantic lace. Darling floral A-line mini by Sherri Hill. Delicate hand cut lace appliques take this pleasant tulle party dress to new heights, while the full short skirt adds some fun flare.When it comes to romantic glamour, you can`t go wrong with this exquisite Sherri Hill 11153 cocktail dress! Layers of ultra-fine material lend the short, flared skirt a frothy, frilly look that you`ll love. Contrasting lace patterns breathe excitement into the fitted top and dropped waist, and matching cap sleeves complete the look.